Eudialyte is a complex silicate mineral that most commonly forms in granular patterns. It is usually found within coarse grained rocks and contains calcium, cerium, sodium, iron, manganese, zirconium, and yttrium. This stone ranges in color from pink and red to brown, violet, and even green; sometimes with inclusions of Black Tourmaline. It was first discovered in Greenland by F. Stromeyer in 1819 and was named after the Greek words eu dialytos meaning, “well decomposable” or “easily dissolved”. This name is in reference to its easy solubility in acids. It is also somewhat delicate with a hardness ranging from 5-5.5. The most prestigious Eudialyte comes out of Greenland, Russia, and Canada, but can also be found in Madagascar and US. Eudialyte has developed the nickname of “The stone of the heartland” due to its connection to the energies of unconditional love and its ability to root these energies into the Earth plane through thoughts, feelings, and manifestations. Physical existence often puts a primary focus on our survival needs (food, shelter, safety) leaving emotional needs in the background and fully ignored in some cases. 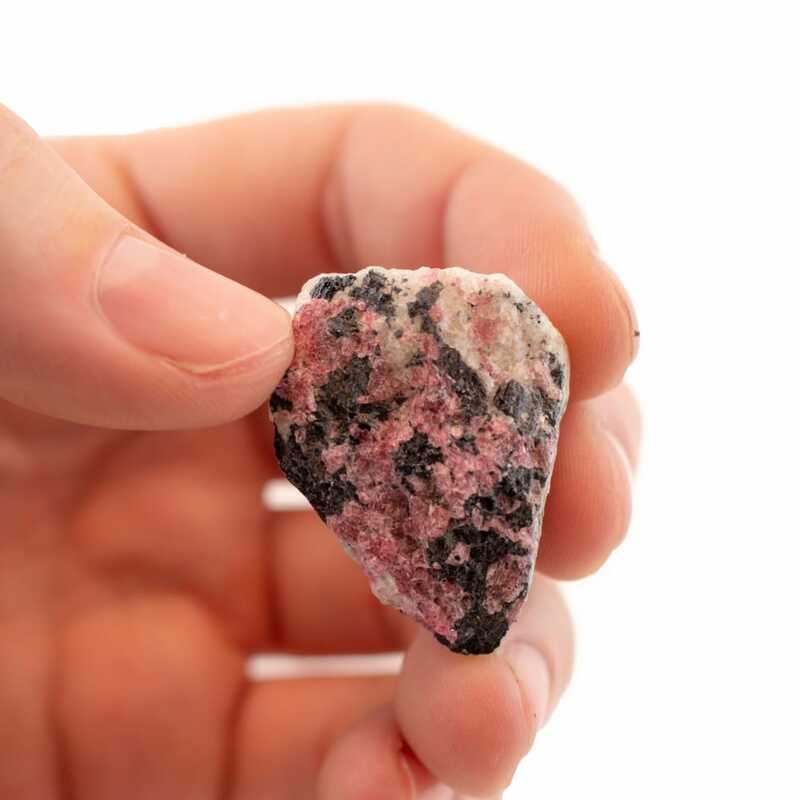 Eudialyte provides one with the vitality to ensure survival needs are met but also the love energy necessary to recognize and fulfill the heart’s desires. It is a stone that brings balance to physical and emotional needs so that one may live with a harmonious experience of the two. Eudialyte strongly links the heart and root together, opening the doorway to increased synchronicities that bridge the gap between what must be done and what the heart wishes to do. It is a powerful ally in bringing one’s dreams and inspirations to life. As a water and earth element stone, Eudialyte’s energies help to balance one’s inner emotions with external experiences. Eudialyte provides life force, self love, and protection to those who work with it and has a strong impression on the emotional body. It opens us to the wisdom of the heart, teaching us how we can work on ourselves to heal and balance the emotions; rather than looking outward for the solution. Eudialyte is a powerful guide for diving into the heart as it empowers one to face depression and self-dissatisfaction so that one may find the underlying cause of these feelings. It promotes absent-forgiveness of the self and others as well as self love; releasing one from the negativity caused by fear, guilt, anger, and sorrow. This provides us with the time and focus to work on ourselves and learn from our “mistakes”. Overall, Eudialyte is able bring about incredible changes of the inner being and is especially useful during turning points in one’s life. Eudialyte has a deep connection with soul relationships and is able to show us the purpose in each one. It shows us the soul companions of the past, revealing the reason for meeting them and their purpose in our lives (whether they are still with us in the physical realm or not). When meditating or sleeping with Eudialyte, it grants insight as to why certain soulmates may be rejecting you and whether or not they truly are soulmates. In cases where you feel an extreme attraction to someone, this stone will help you figure out whether you are destined for a sexual relationship with someone or if your soul is pulling you towards spiritual work that needs to be done. The vibrations of Eudialyte are perfect for dissolving feelings of jealousy, resentment, and strong hostility; allowing one to build the self confidence to overcome these feelings. Eudialyte is also very beneficial for anyone who feels “lost” and doesn’t know what they desire or what path to take in life. It aids in identifying our gifts and talents as well as an appropriate way to express them, so we may create a pathway to a fulfilling life. Physically, this stone supports the optic nerves, brain waves, and cells on a multidimensional level. Eudialyte harmonizes well with Lilac Lepidolite and will increase the synchronicity and self healing effects of both stones. To increase Eudialyte’s grounding capabilities, use Ruby or Black Tourmaline in conjunction with Eudialyte. Rose Quartz works harmoniously with Eudialyte in cleansing the heart so that one may awaken it and attune to its wisdom.